The rufous-bellied woodpecker (Dendrocopos hyperythrus) belongs to the family of woodpeckers and piculets, the Picidae. The rufous-bellied woodpecker species is distributed in Pakistan, India, Nepal, Bhutan, Bangladesh, southeast Asia, China and Russia. These woodpecker species feed on insects and plant-sap. These woodpeckers are polytypic species. The rufous-bellied woodpecker (Dendrocopos hyperythrus) is a medium sized woodpecker, measuring 20 to 25 cm in length and weighing 40 to 50 grams. These woodpecker species have distinctive white barred black mantle and wings. The face, lores, supercilium and forehead are pale gray or whitish. The throat and belly are rusty brown or cinnamon. The lower belly is black with white barring. The vent area is pinkish red. The males have red colored crown and nape and the females have white spotted black crown and nape. The juveniles have blackish barring on the buff throat and underparts. The bill of rufous-bellied woodpecker is straight and sharp. The upper mandible is steel gray and the lower mandible is yellowish gray. The irises are blackish brown. There is a dark gray eye-ring. The legs and feet are colored olive or gray. The call of these woodpecker species is a rapid, high pitched "tik..tik..tik" or "chit..chit..chit" sound. 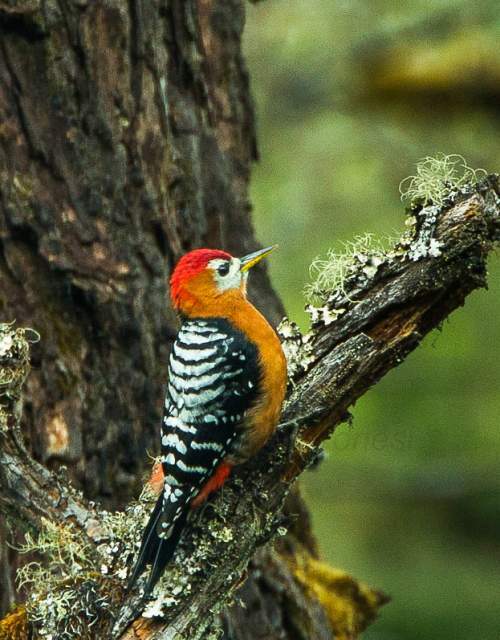 The rufous-bellied woodpecker species is distributed in Pakistan, India, Nepal, Bhutan, Bangladesh, Myanmar, Thailand, Cambodia, Laos, Vietnam, China and Russia. 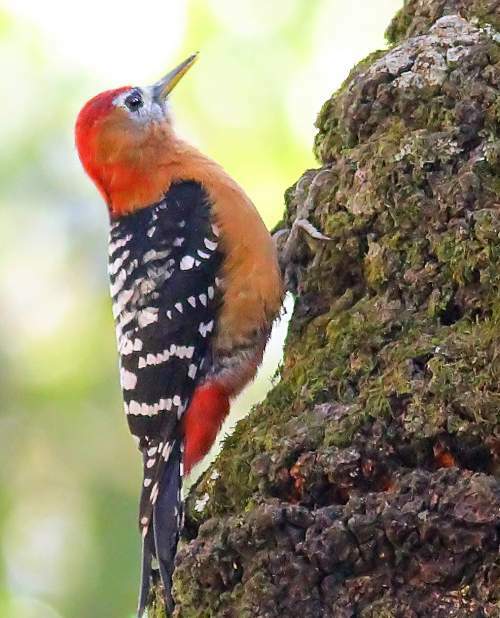 In India, these rufous-bellied woodpecker species are distributed in the states of Jammu and Kashmir, Himachal Pradesh, Punjab, Uttarakhand, Sikkim, north West Bengal, Assam, Meghalaya, Arunachal Pradesh, Nagaland, Manipur, Tripura and Mizoram. 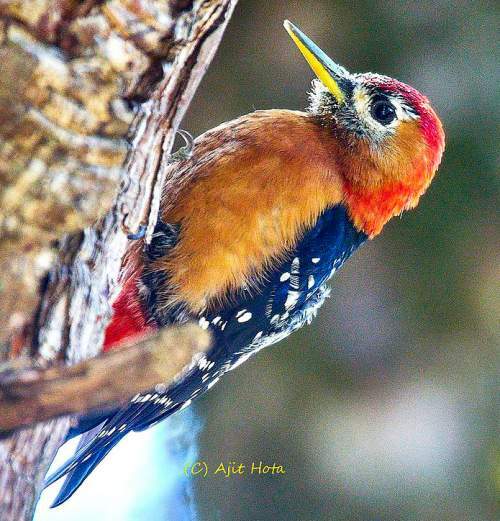 The rufous-bellied woodpecker nominate subspecies D. h. hyperythrus is distributed in north India (Uttarakhand), Nepal, Bhutan, Bangladesh, northeast India, central and south China, central Myanmar and northwest Thailand. The woodpecker subspecies D. h. marshalli is distributed in Himalayan foothills in northeast Pakistan and northwest India (Jammu and Kashmir, Himachal Pradesh). The rufous-bellied woodpecker subspecies D. h. subrufinus breeds in northeast China and southeast Russia. It winters in southeast China and north Vietnam. The subspecies D. h. annamensis is distributed in east Thailand, Cambodia, southern Laos and southern Vietnam. These rufous-bellied woodpecker species have high forest dependence. They normally occur in altitudes from 500 to 4300 meters. The natural ecosystems and habitats of these woodpecker species include tropical and subtropical moist montane forests, coniferous forests, boreal forests, broadleaved forests, tropical and subtropical moist lowland forests and temperate forests. The diet of these rufous-bellied woodpecker species consists mainly of insects. Beetles, grasshoppers, locusts, crickets, moths, caterpillars, spiders and plant material are their primary food. These woodpecker species feed on wood boring and bark dwelling insects. They also feed on plant sap, by using their brushy tipped tongue. The same tree may be used again and again for extracting sap. The breeding season of these rufous-bellied woodpecker species is during April and May in India, Nepal, Bhutan and Bangladesh. The laying season is from March to May in southeast Asia. These species are monogamous and show territorial behaviour by drumming. The nesting sites are holes in tree trunks. The breeding pair excavate nesting holes. The clutch contains four to six white eggs. Both the parents incubate the eggs and take care of the young. These rufous-bellied woodpecker species are partially migratory birds. The subspecies D. h. subrufinus breeds in northeast China and southeast Russia. It migrates southwards to southeast China and northeast Vietnam for wintering. The other three subspecies are non-migratory resident birds. Post breeding, the juveniles may disperse and establish in new locations within the range. Within their range they may make local movements for feeding and breeding. The global population size of the rufous-bellied woodpecker (Dendrocopos hyperythrus) has not been quantified. The overall population trend of the species is considered to be decreasing. In most of its range, this species is reported to be rare to uncommon. The generation length is 5.2 years. Its distribution size is about 11,600,000 sq.km. Habitat alteration and destruction, deforestation (del Hoyo et al. 2002) and capture of adults and juveniles for pet-trade are the main threats that are endangering the survival of these species. The rufous-bellied woodpecker (Dendrocopos hyperythrus) does not approach the thresholds for being Vulnerable, either under the range size criterion, or under the population trend criterion or under the population size criterion. The CITES (Convention on International Trade in Endangered Species of Wild Fauna and Flora) status is ‘Not Evaluated’ for the rufous-bellied woodpecker (Dendrocopos hyperythrus). The rufous-bellied woodpecker (Dendrocopos hyperythrus) is closely related to stripe-breasted woodpecker (Dendrocopos atratus) and fulvous-breasted woodpecker (Dendrocopos macei). The four recognized subspecies of the rufous-bellied woodpecker (Dendrocopos hyperythrus) are: D. h. hyperythrus (Vigors, 1831), D. h. marshalli (E. J. O. Hartert, 1912), D. h. subrufinus (Cabanis & Heine, 1863) and D. h. annamensis (Kloss, 1925). Current topic in Birds of India: Rufous-bellied woodpecker - Dendrocopos hyperythrus.